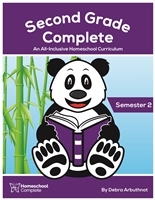 Second Grade Complete curriculum will challenge your child and continue to build higher-level thinking and problem-solving skills that create a love of learning. The teacher’s manual includes step-by-step instructions, activities for different learning styles, all practice worksheets for each lesson, reading comprehension pages, enrichment activities to challenge learners, and an appendix with resources. Meet the needs and challenge the abilities of your second grade student. It’s comprehensive, yet easy to follow. Teach higher-level thinking and problem-solving skills that create a love of learning.